Matthew’s Gospel seeks to form a community of faith in which people faithfully confess Jesus as “the Messiah and Son of God” and follow him in lives of creative and adventurous discipleship. 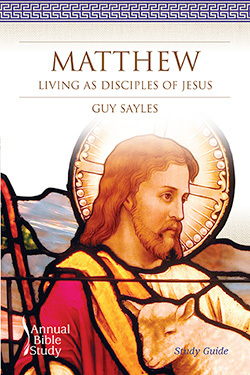 Journey through the book of Matthew with the Matthew Annual Bible Study from Smyth & Helwys as we venture to live as disciples of Christ. Receive encouragement for your life of faith with the 2007 Annual Bible Study. Both the Teaching Guide and Study Guide, which are illustrated with art images, photos, and maps, were written by Guy G. Sayles. Each chapter in the Matthew Teaching Guide includes teaching options and approaches for leading discussions. The study examines biblical background, historical interpretation, as well as spiritual, ministerial, and theological themes. It also includes relevant lesson plans for children and youth. The Matthew Study Guide serves to educate the learner, to offer an overview of theological themes, and to build the learner’s Bible study skills by considering several significant interpretations.